2019 ON1 Photo RAW: A Viable Alternative to Photoshop & Lightroom? RAW file converter, photo editor and photo library duties usually fall to the most popular software products like Adobe Lightroom, but there are alternatives on the market providing a different workflow and results. On1 Photo RAW is one such product, which aims to integrate the most used features from Adobe Lightroom and Photoshop in one package. Not to be just a fancy RAW converter, but an all in one solution for image editing. This sounds very promising as image editing can involve constant swapping between Lightroom and Photoshop depending on how deep your edits. Adobe does a fantastic job of integrating the two pieces of software, but having those needed tools under one roof would be beneficial. With a few options on the table, let’s see if ON1 Photo RAW is a viable alternative to the other raw converters, Lightroom and Adobe Photoshop. As ON1 Photo RAW is marketed as an alternative to Adobe Lightroom and Photoshop, let’s see if it measures up. There’s definitely visual similarities, from the color schemes to basic layout. ON1 Photo RAW has the same easy to find areas like in Lightroom, such as basic tools, sharing, presets and organization. On the surface, you get the same efficiency in labeling and rating your images before they are processed, along with nondestructive editing. In this new version, the sliders are made a little smaller and everything seems to have a cleaner look, helpful for navigating the software. There are also new filters such as curves, color adjustments, and film grain. All filters are searchable and are non-destructive. Camera and lens support profiles are in here with over 800 models covered. 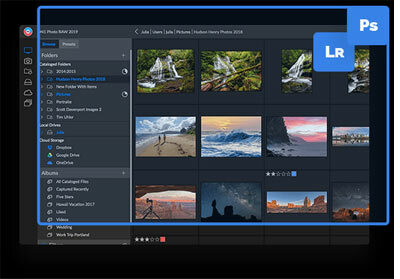 Organization of images with keywords has been adopted from Lightroom, so you can easily search for images via keywords. Metadata is also easily inputted which you can change for every image. Ease-of-use editing tools are very Lightroom-esque, now with the addition of layers, text tools, retouching brushes, just like Photoshop. The tab style of layout from Lightroom has been adopted with the ‘Develop’ tab for global adjustments, the ‘Effects’ tab for adding layers and filters, ‘Portrait’ tab for facial adjustments and ‘Local’ tab for smaller area adjustments. There are also additional tabs for focus, layers, panoramas, and HDR. This means that ON1 Photo RAW have taken the clean design from Lightroom with the features that people are most happy with, then added Photoshop functionality for good measure. For instance, you can use PSD files within ON1 Photo RAW with layers. Layers in Lightroom would be fantastic, but Photoshop has to be called upon for this functionality and advanced editing. To be fair to Lightroom, it is more of a digital darkroom where the adjustment brush for local editing is usually sufficient nine times out of 10. Layers on top of Lightroom functionality greatly expands the creative possibilities and for deeper edits. The new AI Masking tool in ON1 Photo RAW works fantastically for local editing and masking duties. There’s a handy text tool which you can use from text overlays to simple watermarking. Focus stacking is surprisingly straightforward and nowhere near as an in-depth a process as in Photoshop. Additional to this feature is the Autoalign Layers, great for lining up a bunch of images. You can also make virtual copies of an image and apply nondestructive editing. In ON1 Photo RAW this is called ‘Versions’ and a great way to compare the changes made on two copies of an image. 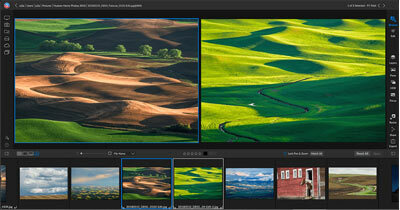 Stitching panoramas works ala Lightroom with a simple Merge to Panorama selection and a very quickly working preview. Panoramic images are exported as PSD files rather than one big RAW file as in Lightroom. Noise reduction in ON1 Photo RAW can be applied both globally and locally. You can simply brush over an area, then change the noise settings of your choice or use settings globally. HDR images are also catered for merging together images with the settings of natural or surreal, automatic or manual. Manual mode gives adjustments similar to general setting changes, with the results on a par with what you find in Photoshop or Lightroom. It’s very easy to overcook an HDR image, so it’s good to have complete manual control in this area. Masking in ON1 Photo RAW was first introduced in the last version, with more advanced features this time around. Global and luminosity masking, painting on select areas of an image is an easy enough process. Light and dark areas can easily be masked off with the luminosity mask and used along with layers, becomes a very powerful feature. When you’re working away in Lightroom, all edits are done in the Develop tab. In the 2019 ON1 Photo RAW the processes are split into more tabs to cover the extra functionality. As previously said the ‘Portrait’ tab is for facial adjustments. This can include skin smoothing and local editing. Having this functionality under one tab separates things out nicely, to can come back to editing in the future and still see visually on each slider what has been changed. This applies to the other tabs, where all those individual changes in Lightroom are now seen in each tab and with their own sliders. One of the most tempting pieces of fruit when buying into On1 Photo RAW is the one-off fee. The latest version will set you back $100, with an upgrade from a previous version being $80. The downside is you will have to pay the upgrade fee for the next version. Conversely, Adobe charge $10 per month for which you receive Lightroom CC and Photoshop bundled with some cloud storage. This works out at $120 per year. Stop paying and you can’t use the software. In other words, 10 months of Adobe use pays for a copy of On1 Photo RAW, which can be used for as long as you want. However, with Adobe you get new features as they come out at no extra cost. Choosing On1 Photo RAW as a complete replacement for Photoshop and Lightroom is not definitive, as Lightroom still seems to feel more mature and if you want real deep editing there’s nothing like Photoshop. However, for those who work predominantly in Lightroom and would like some Photoshop features, you can’t go wrong here. If you want alternatives from a simple raw converter to similar functionality, then there are quite a few options such as Adobe Camera Raw, Capture One, DxO and GIMP including UFRaw. If you just want a simple RAW converter, there are many options on the market with some arguably giving slightly different conversion results to the others. But in reality, you’ll soon be wanting an integrated way to organize your images and further functionality. For an all in one solution, On1 Photo RAW is definitely giving Adobe a run for its money.